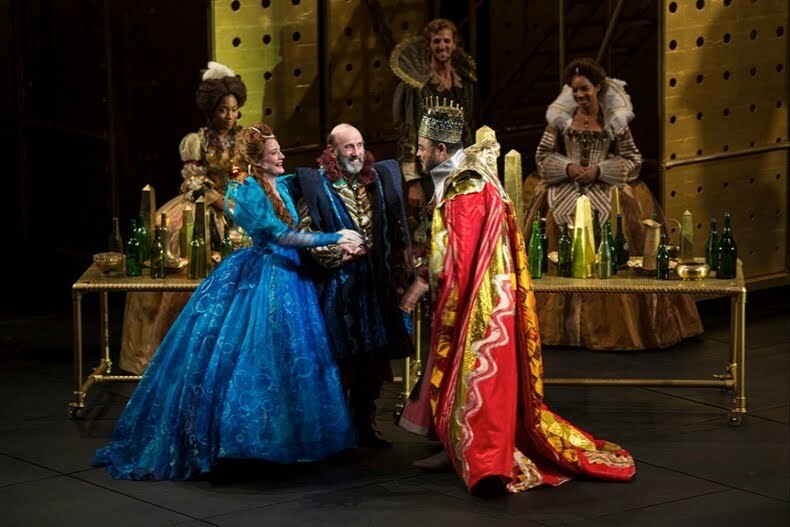 Carol's Theatre Reviews ~ It's Fun To Go Out: Old Globe’s “Hamlet”: A Welcome Return Of The Long Overdue Masterpiece. Old Globe’s “Hamlet”: A Welcome Return Of The Long Overdue Masterpiece. 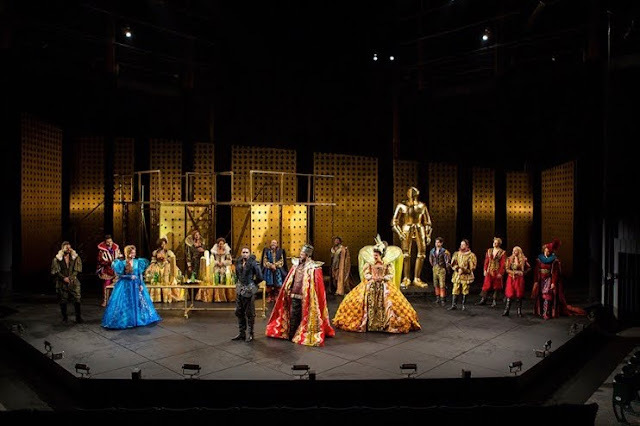 It’s been ten years since the then artistic director of the Festival Darco Tresnjak produced the Bard’s “Hamlet” on the Festival Stage. Before that it was seventeen years. For those not holding tickets for this production now would be a good chance to get a pair. “Hamlet” will be playing through Sept 10th. The long awaited “Hamlet” with executive director David Edelstein at the helm started off a bit slowly on opening night. 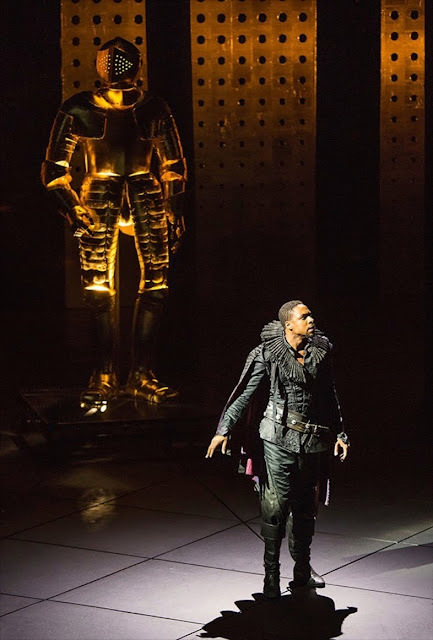 After a few technical glitches were ironed out and the ghost of the dead King (Michael Genet) in full armor, lumbered onto the drawbridge frightening the bejuses out of the centuries on guard duty, the production sailed into high gear. 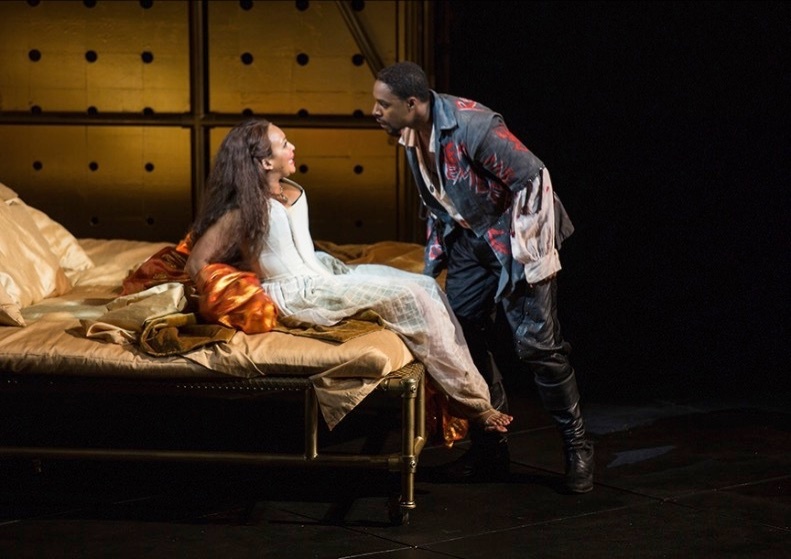 Spooked by what Hamlet’s friend Marcellus (Amara James Aja) saw that night, he begged Hamlet to return the next night to confront the ghost. Hamlet is not the only tragic figure in this Shakespearean tragedy of biblical proportions. His father the King is dead. His mother Gertrude (Opal Alladin) is married to the King’s brother; her brother-in-law Claudius (Cornell Womack) and “Something is rotten in the state of Denmark”. His best pals Rosencrantz (Kevin Hafso-Koppman) and Guildenstern (Nora Carroll) have turned against him, and are now doing the King’s bidding. He is being denied entrance to his one time lover’s apartment, and the ghost of his deceased father makes his son, the young prince, swear revenge on his uncle, the king. It’s a murky mess rife with Oedipal themes and psychological musings. Surprisingly, no one in the court of the Royal Danish Castle of Elsinore, sans young Hamlet, seems suspect of the sudden death of the King Hamlet or nature of his death (snake bite, they say while he was sleeping), or of the hasty marriage of Gertrude, Hamlet’s mother to the kings brother. The body was still warm! No raised eyebrows from the court’s counselor, Polonius, not Hamlet’s one time lover Ophelia, Polonius’ daughter and love interest; no one seems the least bit phased. It’s business as usual. Edelstein’s casting of this show is, in many ways pretty much top notch. That Grantham Coleman’s Hamlet is himself young, good looking, agile, sane and insane at the same time gives another dimension to this altogether complicated character. Coleman hops, slides, wanders and jumps around the stage like an animal seeking out his prey as madness/or not sets in. His “To Be or Not To Be” soliloquy is pensive, passionate and complex and edgy, leaning on the moral issues of suicide. From the outset, when he learns of his father’s mysterious death and his mothers and uncle’s marriage, his portrayal as pretending to be mad puts him one step further into an ominous demise. His commitment to seek revenge takes over his life and even his sanity is in question, a sport in which Hamlet delights. His interactions with his friends change like the wind depending on whether he thinks they are friend or foe. Most of them, in his mind are foe. And when he pretends to be mad, he is more than convincing, pouring out the Bard’s words as they belonged to him. Coleman is a fine enough actor to let his emotions rage without raging himself. He might be best served to let them build slowly as the reality of his fate settles in and he discovers the unthinkable. In contrast, Cornell Womack’s Claudius is calm, collected, mature and not deterred in his mission to head his kingdom whether Hamlet stays in Denmark, goes back to University, goes mad or disappears (read gets killed off), a chance the new king is willing to take as he sends the young prince off to England. He’s cool and gives a reassuring atmosphere to the rest of the court. One might note that just below the surface, he’s revengeful, crafty, burning with rage because Hamlet is so difficult, but one would hardly notice. His larger than life presence overshadows his fear of Hamlet, yet Hamlet’s feigned insanity will soon wear on him. Gertrude, his mother is another one who seems unperturbed by the events that just happened. (“Frailty thy name is woman”) She too appears cool, calm and collected until she also fears Hamlet. Alladin certainly looks the part and as Gertrude she is aloof and an onlooker rather than a player. She casts a worried eye on her son, but never lends an explanation as to her husband’s death only a reassurance that what she’s doing is OK. She is on her son’s side except when she’s not. She’s welcoming of Ophelia and agrees with her until she’s not in agreement. Claudius’ support system is the sly like a fox Polonius (Patrick Kerr) who is at his utmost best as the loquacious and comical (without his knowing, of course) advise giver and general tochas licker in the court. Kerr’s performance is such a fine balance between the old and the young and the experienced and the beginner, the confident and the hopeful and the soothing and the prickly. He goes on and on and on so much so that one wishes he would stop his pontificating already. (It’s in the script) It’s such fun to watch and listen as he recites, in beautifully balanced cadences, Shakespeare’s words. We wouldn’t have him any other way. Ophelia (Talley Beth Gale), his daughter is in love with Hamlet and from the letters in the letterbox, the feelings were mutual. Claudius’ intentions are to make sure she does not marry Hamlet. 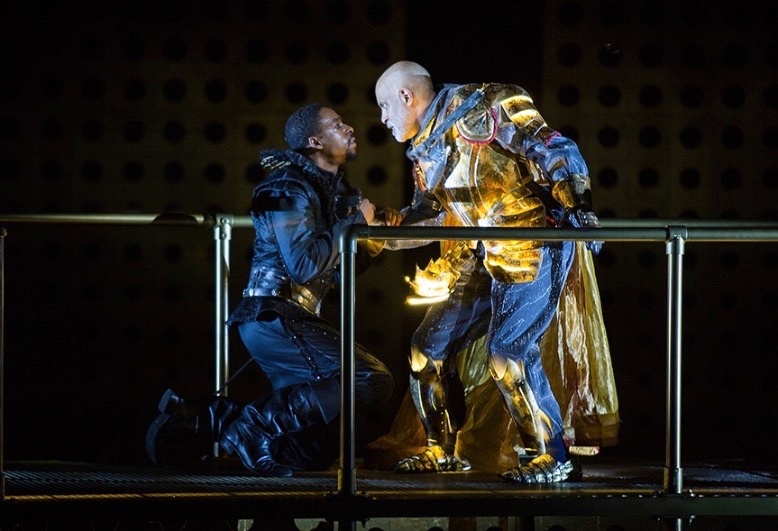 He sees to the kings every wish even to the point of plotting against Hamlet with the now king. Gale better cast as the insane rather than the sane young woman in love with Hamlet. As she presents herself going mad, she’s fragile and at the end of her wits, singing Curtis Moore’s original compositions, about flowers and wearing a throne of twigs and offering smaller twigs to the royal couple. 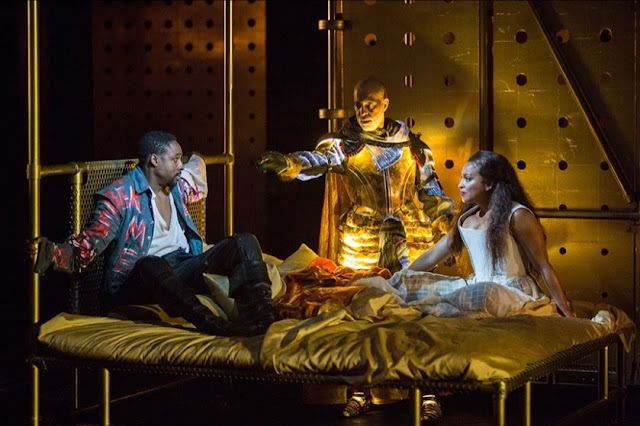 She is most pathetic when she appears before the royal couple in tattered clothes after she learns of her father’s tragic death at the hands of Hamlet. Her mad scene (and she really does go mad as opposed to Hamlet’s feigned madness) is absolutely and tragically agonizing to watch. When her brother Laertes (Jonny Orsini) learns of their father’s death, he’s thundering mad and threatens to kill Hamlet. He challenges Hamlet to a duel admitting to Claudius that he is better with the sword than his one time friend. He and Claudius cook up a plot to have the blade on Laertes’ sword laced with poison. In the background Hamlet’s friend Horatio (Ian Lassiter) offers fine support as the only person Hamlet trusts. Again, he convinces that their bonds are strong and Hamlet can always depend on him. At plays end, when Horatio holds the young prince in his arms, after his duel is fought and he has drunk the poisonous wine that killed his mother and Claudius, he cries out in agony, “good night, sweet prince”; I felt a nag in my heart even though I knew it was coming. A strong ensemble makes up the rest of the players. They wander in out and about, move the half finished set (Tim Mackabee) of scaffolding (curious choice) and place and reposition as needed. Credit Jacob Grigolia-Rosenbaum as fight director, David Huber, vocal coach, and Sten Severson, sound design. Lighting designer Stephen Strawbridge’s design is some of then best seen on the open stage in some time. Kudos for that. Props are minimal and used sparingly. In the background is a huge (Hit me over the head to make a point) golden statue of the deceased king, illuminated (Stephen Strawbridge) and overpowering looking. Cait O’Connor’s costumes are a mixed bag with gorgeous looking courtly period pieces on some and others in rag tag street duds as seen in the players in Hamlet’s ‘play within the play’. Polonius, “I don’t like the classics in modern dress” is definitely not in script but the sentiments ring true, at least to this reviewer. Edelstein, whose expertise is Shakespeare, deserves a stamp of approval for this well- rounded and outstanding and thought provoking production of “Hamlet”, which he mentions in his notes on the recent death of his own father was ‘on his mind’ as he dealt with his own loss. It’s Shakespeare and “Hamlet” at its best.